The Last Gasp of Dressing Up? That’s all in good fun. But it’s also too bad. Easter Sunday is the last tenuous link to the days when a wide swath of the culture believed fashion could be used — without a hint of sarcasm or irony — as a marker of moral rectitude, a symbol of earnest faith, a show of respect. On Easter Sunday, folks got dressed up because they wanted to celebrate life and generosity of spirit. When is the last time anyone ever equated those characteristics with the fashion industry? It’s almost impossible to conceive that fashion once played an integral part in helping people express the joy and redemption that they felt deep within their souls. Read the entire article by Robin Givhan at The Washington Post. 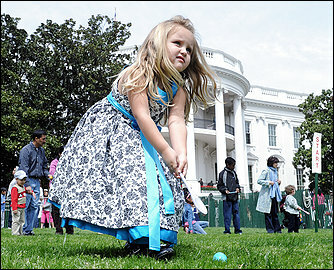 This entry was posted in Elegantology and tagged Easter Clothes, Robin Givhan, The Washington Post. Bookmark the permalink. 8 Responses to The Last Gasp of Dressing Up? It’s such a shame. I see how people send their kids to birthday parties…how they themselves dress when invited to a cocktail party! Very few people care what people think of them or care about themselves anymore. gasp is right. I still dress up for the airplane when everyone else is in track suits. I dressed very simply this Easter, wearing my favorite pencil skirt with a blue fine-knit sweater and low heels. Everyone told me how lovely and “retro” my outfit looked. Retro? A skirt and shirt? On the other hand, the attire of brides is becoming increasingly extravagant. Everyone wants a ball gown, no matter how informal their ceremony. Perhaps the two trends are related – a lifetime of suppressed desire to dress in pretty things manifests itself in one excessive day. Chris, you know what I think about this, and at the White House!! The little girl in the foreground is adorable! I have an interview with Robert Anders up on my site that is fascinating! I agree with Suburban Princess – your last sentence. I think Nero is playing a fiddle somewhere. Our daughter was honored to be able to volunteer at the White House Easter Egg Roll a few years back, with President and Mrs. Bush as hosts. She had a memorable time and came home with fascinating stories. We spent a great deal of time planning what she would pack, what her back up dress plan would be in the event of chilly weather or rain, etc., and thought it all through very carefully. I told my daughter that dressing appropriately for the occasion was her duty and obligation, that if you take on a job, or accept an invitation, you have a duty to “step up” and dress right, speak right, act right. Okay–cut to folks showing up in jeans to the White House. It is selfishness, pure and simple. The big me. Thinking only of oneself, not thinking beyond their own comfort, not considering how the host might feel or what their “duty” is to the hosts, occasion, location, etc. So at some point the “adults in the room” need to hold the standard and enforce the rules, even if it is with other adults. Why on earth didn’t the invitations/guest passes/admission tickets specify dress? And if they did, why didn’t an adult enforce it? Because we live in a world of “not wanting to hurt anyone’s feelings, not wanting to judge others, not wanting to come off as a snob,” etc. The notion of “acceptance and tolerance” has run off the rails. It is time for adults to get back into the business of setting the example and enforcing the protocol. I thought that this was a wonderful article and am so glad you drew it to our attention. True, people do not regularly attend religious services, however we still observe the great feasts in a vestigal way thanks to the glory of commercialism. Since we do in a way observe it, wouldn’t it be nice to take young people into a church or synagogue from time to time? They might understand the history of our country and in fact western culture better if they got some exposure to it. Even Charles Schultz put bits of scriptures into his comic strips. People, get the kids away from those gaming consoles…just for a little while!